My heart sank a little at the thought of an exhibition devoted to Goya’s portraits. Undoubtedly he was an important and influential portraitist, but surely there is so much more to his art. Would this be a parade of Spanish notables done up in their finery? And a turning away from all that was imaginative, dark, politically subversive and, dare I say it, interesting in Goya’s oeuvre? I also detect a note of self-satisfaction, even complacency, in the National Gallery’s staging of ‘Goya: The Portraits’. Yet another blockbuster show devoted to one of the great men of European art? Another artist presented as a singular ahead-of-his-time genius? The National Gallery asserting itself as a temple of great art and great artists, of universal and timeless cultural values, but imperiously aloof from the humdrum concerns of, say, labour relations? The National Gallery’s influence, curatorial expertise and affinity with Spanish art are on full display (the lead curator, Xavier Bray, worked there before moving to the Dulwich Picture Gallery in 2011). 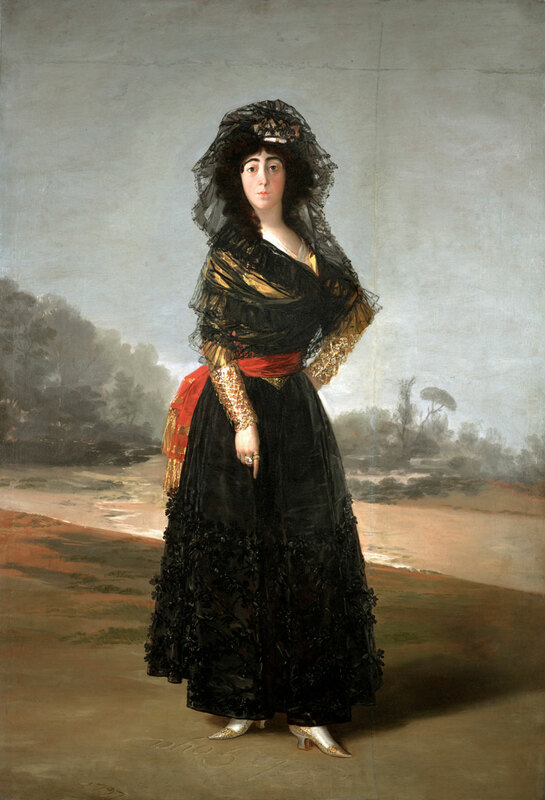 It has brought together nearly half of Goya’s known portraits, including a number that are rarely lent, and some that have never been shown in Britain before. The stunning The Duchess of Alba from The Hispanic Society of America, New York, is a coup. As always, the exhibition is expertly hung, the lighting exquisite. If there is a disruptive element here, it is Francisco de Goya y Lucientes himself. He may have been the servant of the Spanish elite, but his frank and often unflattering portraits betray a human vulnerability behind his sitters’ social performances. By focusing solely on the portraiture, the curators successfully show just how diverse and unconventional Goya’s approach was, revealing the artist’s restless innovation and commitment to creating unique images that play off the tensions between personality and public persona. Few of them are pretty, some are decidedly peculiar, but viewed within the continuum of his career each work can be appreciated as an individual expression of Goya’s wilful defiance of artistic norms. It is a cliché, however, for the curators to claim that Goya was probing the ‘inner life of his sitters’, revealing their ‘psychological depth’. How could we know this anyway? Most of his subjects look out with an inscrutable blankness, or at best an expression of faint surprise beneath arched eyebrows, as though taken aback at Goya’s impertinence. What he does endow his subjects with is a sense of their common humanity, regardless of rank or riches – a daring thing to do in an age of revolution. Yet his clients must have been complicit in this to some extent, otherwise he wouldn’t have risen to become Spain’s pre-eminent painter of royalty and aristocracy. Intent on emphasising Goya’s unique genius, the curators do little to investigate whether the artist’s independence and candour were in fact highly sought after qualities at the time, and mannerisms he self-consciously cultivated. Isolated from his influences, his rivals and the wider artistic context in which he worked, we are deprived of any comparisons. Take, for example, his royal portraits. In a pair of paintings of Charles IV in Hunting Dress and his queen María Luisa wearing a Mantilla (both 1799) the artist depicts a genial couple taking a break from the formalities of court. Is this an example of Goya revealing the personalities behind the royal masks? Or did they employ him to paint these pictures because they knew he could fabricate a more sympathetic image of monarchy at a time when their prestige and popularity were in question? 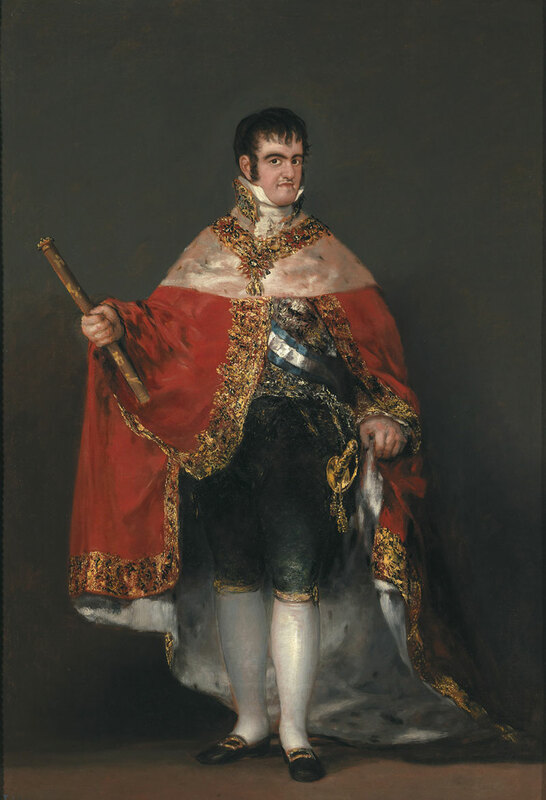 His 1814–15 portrait of Ferdinand VII, who had newly been restored to the Spanish throne, is an image of majesty regained, the king resplendent in Court dress. But it is also tempting to see it as a critique of this reactionary and repressive ruler, Goya making little effort to moderate Ferdinand’s brutish features or grasping hands. And by awkwardly overloading the king with a voluminous gold-encrusted robe, is the artist implying that Ferdinand is not quite up to the office he has been called on to fill? If this is the case, how did Goya get away with it? In Ferdinand’s steely glare is there perhaps a challenge to the artist, that he is more than equal to Goya’s audacity? This portrait, like the others in the exhibition, is a complex conversation between sitter, artist and audience. It is an over-simplification to make it all about Goya. For someone supposedly so maverick, Goya was remarkably adept at navigating the turbulence of regime changes, wars and revolutions. Eventually, however, he was caught out, when Ferdinand VII assumed absolute power in 1823 and suppressed the liberal constitution. Significantly, it was Goya’s political allegiances, rather than his art that proved to be his undoing. He fled into exile in France, where he remained until his death at the age of 82, in 1828. The Spanish Enlightenment, the struggle between liberals and reactionaries, the French invasion and War of Independence, the overthrow and restoration of the monarchy, all provide a vivid backdrop to the narrative of Goya’s career described here. But frustratingly, he is presented more as a commentator on, rather than a protagonist within, these historical developments. We never really find out what he believed in or how his beliefs shaped his art. The museum’s new director, Gabriele Finaldi, is part of the Spanish connection, having come from the Prado (which has lent 10 works to the exhibition). Prior to that, he was the National Gallery’s Curator of Italian and Spanish Paintings. He is evidently pleased to be kicking off his second tenure at Trafalgar Square with a Goya show that is sure to be a critical and popular success. But does he have ambitions to shake off some of the National Gallery’s complacency and lead it in more radical and interesting directions? ‘Goya: The Portraits’ is at the National Gallery, London, until 10 January 2016.